I marveled at her generosity to send these huge and wonderful books, some even signed like the ones from Guy Fieri and Jim Dodge. Gloria and her husband attended culinary school and worked with both of those amazing chefs. 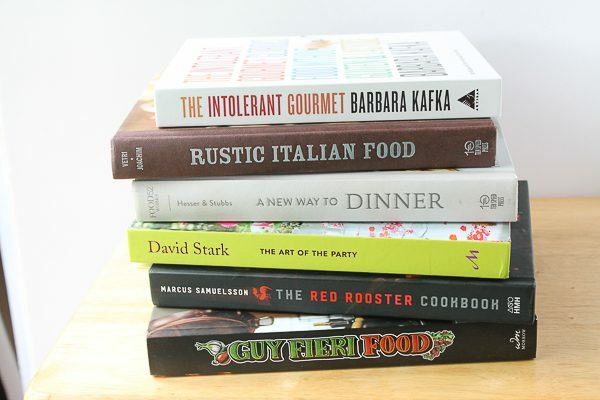 You will be seeing future blogs from these books as there are so many recipes I want to try. I had a hard time deciding what to make for today, but when I found “Spring Pea Pasta” from the great Marcus Samuelsson in his Red Rooster Cookbook, I knew it would be a perfect fit for now. 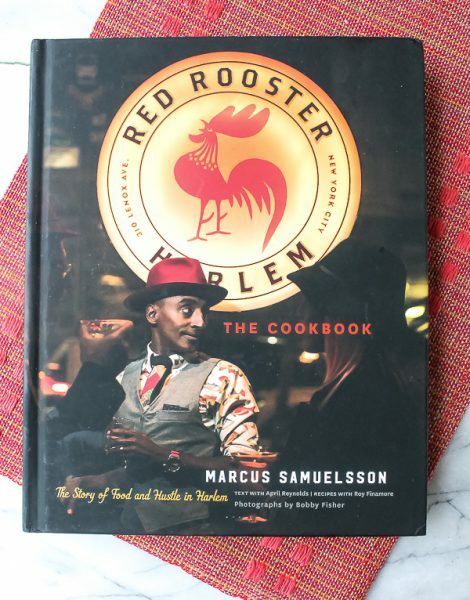 You need to buy The Red Rooster Cookbook. It not only contains wonderful recipes, but the stories told by the chef are heart-breaking and inspirational. (I also recommend his Yes, Chef biography and of course all his cookbooks!) My daughter Kristina and I have met the chef a few times and found him encouraging, kind, and exceedingly talented. Thank you, Gloria, for putting Marcus back on my shelf! I plan on adding all the rest that were lost in the flood. The pasta dish was divine. 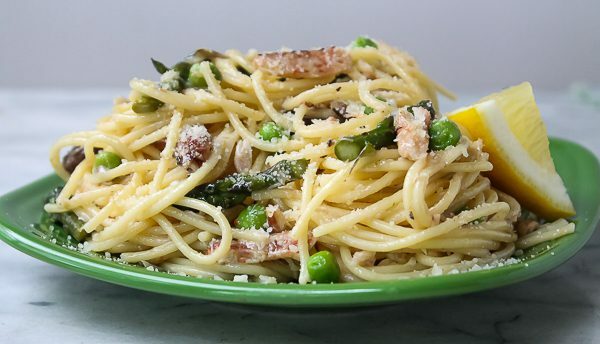 The paragraph above the recipe says this bright pasta is offered to introduce Spring to the menu. It’s truly a beautiful dish with asparagus, peas, fava beans, crabmeat, and a flavor I hadn’t tried yet, yuzu kosho, which is a delicious combo of citrus, heat, and salt. I’m hooked on it now. Serve with a squeeze of lemon and you will be transported to culinary heaven! Gloria, I don’t know how to thank you for these incredible books. I love every one and can’t wait to start cooking from them. I keep your note safely tucked inside the Marcus cookbook on the pasta recipe page. 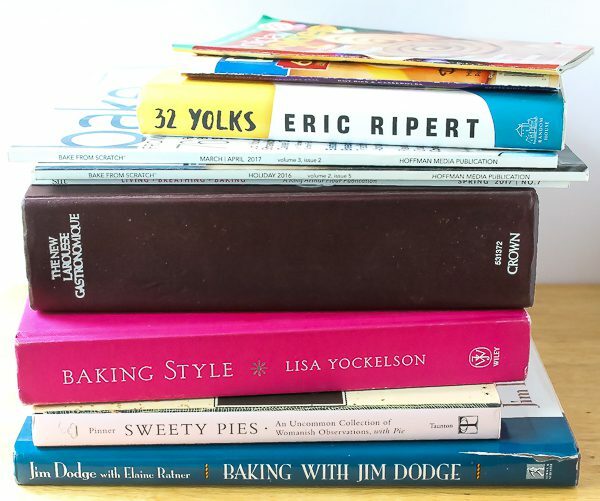 I will never forget how in the first few days of the flood, you definitely brought a smile to my face and tears of joy that the books were delivered on the same day that all my mud-drenched and much-loved cookbooks were being tossed into a dumpster by the hundreds. Your incredible books helped get me through that first horrible week. I hope someday we can meet, and maybe share a plate of pasta. Heat the oil in a large skillet over medium-high heat. Add the shallot, garlic, asparagus, and yuzu kosho and cook, stirring, until the shallot has softened, about 2 minutes. Pour in the stock. Add the salt and spaghetti to the boiling water and cook until the pasta is 2 minutes shy of being al dente. Drain the spaghetti and add it to the skillet, along with the peas and favas. Cook, tossing with tongs, until the spaghetti has absorbed most of the stock, about 90 seconds. Toss in the butter. Turn off heat and toss in the cheese and crabmeat. Divide among pasta bowls or plates and serve with the lemon wedges. Serves 4-6. Note: Add a handful or two of sliced mushrooms with the asparagus, if desired. What a lovely note- truly my pleasure! So thrilled your library is back on its feet and that you’re back to Cooking and spreading joy through food!! I do hope are paths cross in the future! I’m so happy to hear from you, Gloria! I hope our paths cross too. Thanks so much for writing – and again, for everything! Agree – the kindness of strangers is amazing, and helped me survive the last ten months! I had forgotten about you and Kristina going to Marcus’s restaurant event together! Thank you for sharing your posts! The recipes also are a help! Even if I don’t get to test the recipes at times, at least they’re available for another time! The recipes are available anytime, Dawn! What a wonderful story about the gift of kindness and encouragement. Thank you for sharing your heartwarming account of the generosity of a stranger. I will get some crab tomorrow and make this lovely springtime meal for my family and guests this 3 day Memorial weekend, and be sure to share your uplifting story. Have a special Memorial weekend. Have a great weekend with your friends, Kim!